A fluid between two horizontal plates with different temperatures shows convective dynamics in case the lower plate is warmer than the upper plate. This is caused by the density difference induced by the temperature. Warm fluid is less dense than cold fluid, which causes the warm fluid to move upwards and the cold fluid downwards. The fluid dynamics between the described plates is called Rayleigh-Bénard convection. The most important quantity in such a system is the heat transport. Researchers are trying to determine how the heat transport depends on the temperature difference between the plates. In case of a low temperature difference the system is stable and there is no flow at all. Beyond a certain temperature difference flow will set in, but remain laminar. Increasing the propulsion (temperature difference) even further, the system will eventually become turbulent. Here, liquid parcels violently swirl around each other in small and large whirls. The turbulence initially develops far from the plates, keeping the flow near the plates relatively calm. In such a system the heat transport dependence on the temperature difference is well understood with theoretical models. In addition, contemporary computers can simulate these systems. However, it is expected that from an even higher temperature difference onwards, the dependence will suddenly change and the heat transport will substantially increase. 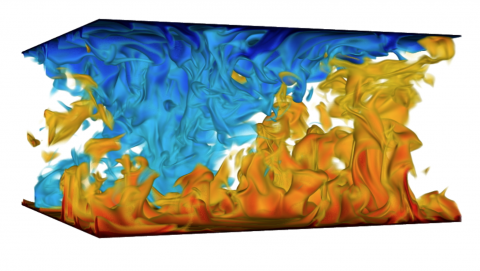 This is caused by the boundary layers also becoming turbulent, allowing for a higher heat transport. The scaling of the heat transport will not change again from this point onwards, according to theory. That is why researchers expect that extrapolations towards arbitrarily large systems can be made from this so-called 'ultimate' or 'asymptotic' regime. This is significant, as it will make it possible to study convection on literally astronomical scales. Convection on Earth and other celestial bodies can then be understood, even though the huge size of these systems prevents them to be accessible in experiments and simulations. Current experiments can only measure locally. However, this is not the case in the simulations that are being performed on the fastest supercomputers in Europe, including the new Dutch supercomputer Cartesius. These computers push the limits of numerical simulations, allowing progressively larger and more turbulent systems to be studied. A temperature field snapshot of Rayleigh-Bénard convection. Red and blue indicate hot and cold fluid, respectively. The temperature difference between the cold top plate and the hot bottom plate drives the liquid in between to a turbulent state. Despite the strong turbulent fluctuations, a clearly visible large-scale flow is present.